The Next Header field in the main header contains a reference number for the first extension header type. The Next Header field in the first extension header contains the number of the second extension header type, if there is a second one. If there's a third, the second header's Next Header points to it, and so on. The Next Header field of the last extension header contains the protocol number of the encapsulated higher-layer protocol. In essence, this field points to the next header within the payload itself. The main header would have a Next Header value of 0, indicating the Hop-By-Hop Options header. The Hop-By-Hop Options header would have a Next Header value of 44 (decimal), the value for the Fragment extension header. The Fragment header would have a Next Header value of 6. This is illustrated in Figure 106. The Next Header field allows a device to more easily process the headers in a received IPv6 datagram. 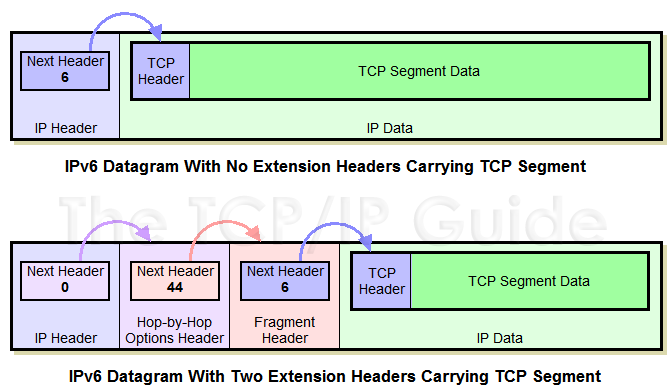 When a datagram has no extension headers, the next header is actually the header at the start of the IP Data field, in this case a TCP header with a value of 6. This is the same way the Protocol field is used in IPv4. When extension headers do appear, the Next Header value of each header contains a number indicating the type of the following header in the datagram, so they logically chain together the headers, as shown above. Key Concept: The IPv6 Next Header field is used to chain together the headers in an IPv6 datagram. The Next Header field in the main header contains the number of the first extension header; its Next Header contains the number of the second, and so forth. The last header in the datagram contains the number of the encapsulated protocol that begins the Data field.